Big Grips iPad cases and stands - for clumsy dads and pre-school kids everywhere! If you regularly let your kids use your iPad or iPad 2, or happen to be incredibly clumsy yourself, you will be keen to invest in this new child-proof Big Grip case for Apple's tablet. The Big Grips Frame is currently only available in the US ($35, plus international shipping costs from www.biggrips.com) but it would be a wise investment for anybody who is concerned about dropping their beloved Apple tablet on a stone floor and seeing it smash into a million tiny pieces in front of their horrified eyes. It is made from a high density foam and comes in a range of bright, childish colours. Importantly, while it gives you maximum tablet protection (oo-er!) it doesn't get in the way of the touchscreen or any of the ports on the iPad or iPad 2. The iPad is already proving to be particularly popular with some lucky school kids, and parents can check out our recent top ten iPad apps for kids feature if they want to know more about the best educational and entertainment apps on offer on iTunes right now. 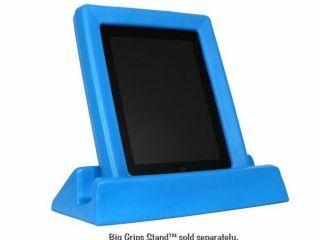 Big Grips is also selling a separate chunky, rubbery stand in which you can safely sit your highly-protected Apple tablet, safe in the knowledge that not even the most angry pre-school child could possibly destroy it… could they?